Every week, we'll be sitting down with one of our gallery artists to discuss their work, process, inspiration, and stories. This week we're speaking with Trine Bumiller. Trine Bumiller's paintings combine imagery of the organic world and of human construction, both as she observes them and through the altering lens of memory. Abstraction and hints of representation engage with one another in the field, paralleling the tension of the perceived and the imagined. 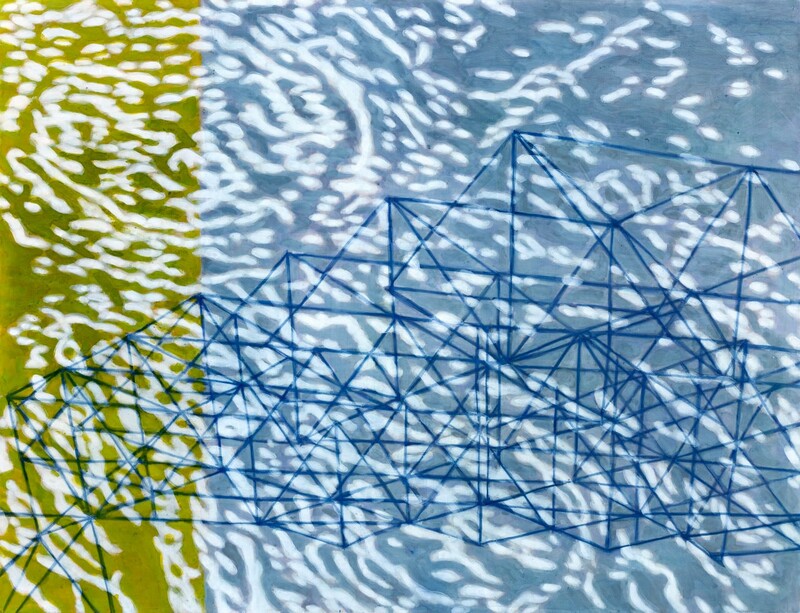 Bumiller captures that dynamic relationship between forces in her paintings in both her imagery and her process. 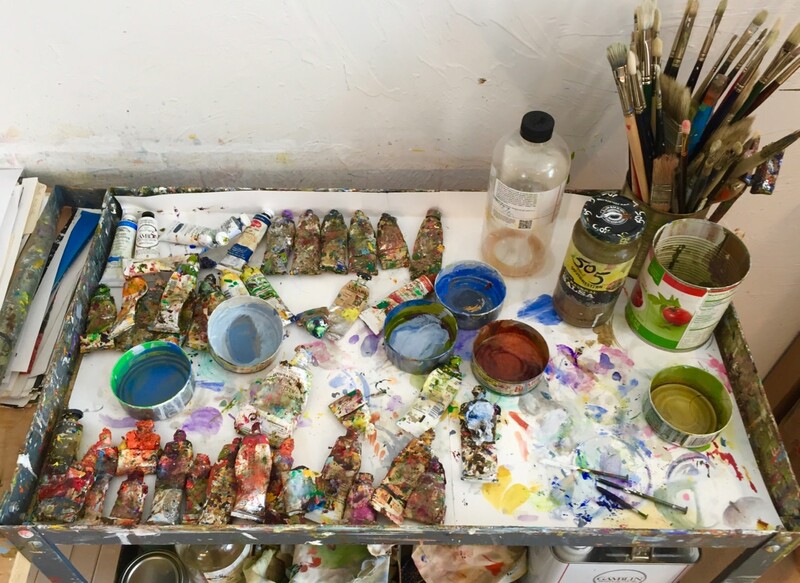 As she builds up her pieces, images are embedded in layers of oil and varnish like insects in amber. Transparency and opacity both reveal and conceal, much like memory itself. The intuitive evolution of Bumiller’s layering and the resulting organic environment is disrupted by what appear to be intervening man-made structures, just how the natural world is constantly veering on becoming lost to memory as human imposition overwhelms it. 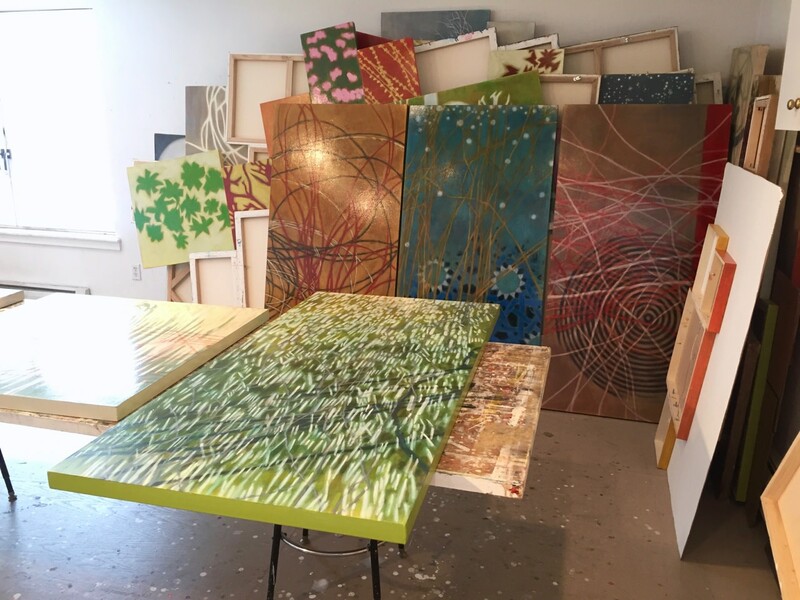 Bumiller spoke with us from her studio in Colorado to elaborate on her relationship with nature, what inspired her to work across multiple panels in her previous body of work, and how she evolved toward the current direction of her work, which will be on view in her forthcoming show, "Interference." What are your earliest memories related to art? How and when did you start becoming an artist? I have been an artist since before I can remember. My father was an architect and travel documentary filmmaker and always had plenty of art materials around for me to use. My mother was very artistic as well. They both encouraged me from an early age. I remember my father showing me how to use tube watercolors at around age four; how to leave white space for clouds, mix colors, and add water for transparency. How did you become interested in abstracted landscape in particular? Was this always your focus, or did you have an evolution towards finding your voice and your concentration? I have always been interested in my environment and the outdoors. I used to spend hours outside in Ohio. Having travelled extensively as a child and now living in Colorado, the landscape and the natural world is something that has always fascinated me. Approaching it like a scientist, learning about the facts and processes that make up our world, and then turning it into an emotional response and finding the universal theories behind things from a purely imaginative perspective is what interests me. I also like finding parallels between our external worlds and our internal ones: making connections through experience and memory. Internally it has always been a focus. It just manifests itself in myriad ways - sometimes more deliberate and specific, sometimes more nuanced. Living in the west has allowed me to experience the landscape much more deeply than I had growing up in Ohio, or in Rhode Island, New York or Rome. I have always lived in cities but searched out natural areas. The proximity and ability to experience those here has probably influenced me the most and given it prominent attention in my work. Slow! I start small, in a journal or sketchbook with the barest minimum of an idea, a scrawl really. I search through images of my own or in my collection of old clippings and find ones that relate to the concept. I make more detailed drawings, make color notes, then fairly detailed watercolors to scale. I transfer these to wood panels that I have sanded and gessoed at least two dozen times for an ultra smooth surface. Then the process of painting begins. I usually work on about four to ten paintings at a time (with the exception of the 100 Paintings for 100 Years series, which I worked on all at once). I paint in oil glazes in many transparent layers, almost like watercolors, building up the surface, colors and forms in a very organic way. I lay the painting flat because my paint is very liquid. That allows for pooling and coalescing of colors and transparencies. I repeat this over a period of about 40-50 days, letting each layer dry for at least a day. The paintings gradually emerge from light to dark. As each painting develops, I allow chance and experimentation to happen along the way. The work in your forthcoming show, "Interference," is a return to working on single panels for you. What drew you to working on multiple panels before, and what inspired you to return to single panels again now? I started doing multiple panels in 2001 for a commission for the University of Colorado's Environmental Engineering building. I was given a long narrow hallway with many obstructions, light fixtures, electrical outlets, ventilation ducts, etc. My subject was an abstraction of a river so it made sense to make a painting that meandered like a river down the wall, avoiding those obstructions. It was called River Story and it was 37 feet long by 30" high. It was during 9/11 that I installed it. Things were uncertain. Even making art seemed frivolous. Painting is a form of hope though. That uncertainty seemed to make sense with uneven asymmetrical edges. 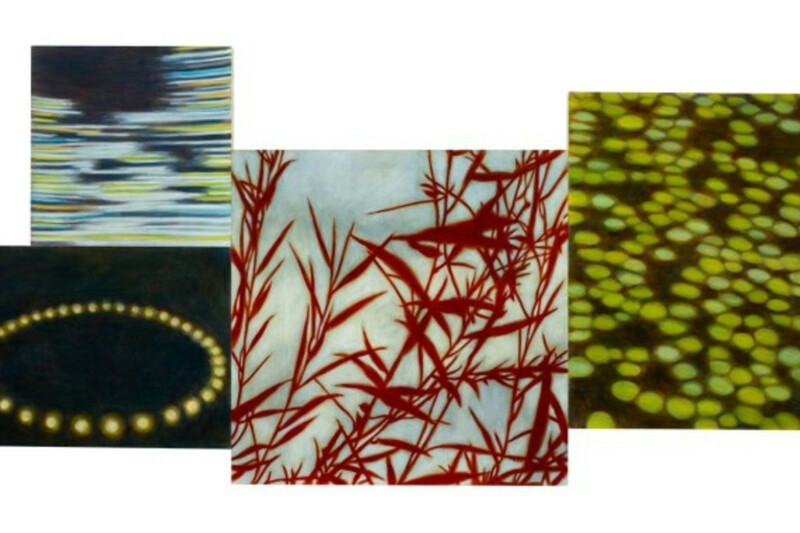 The multiple panels expressed different perspectives of an abstract concept. I continued those for about 10 years, but eventually decided to go back to single panels, layering the images over one surface rather than spreading them over multiple panels. It was time to do something different, to see if I could make paintings that mattered in a single statement. Travel seems like a big part of your life. Do you find that different places inspire you in different ways? How do your travels influence your work? I am not always traveling (I wish!) but when I am I like to record the places I visit, not just the usual things but also the little moments that characterize a place without being specific, my different perspectives. They do influence me a lot, and I often make work out of my travels, specifically when I was an artist in residence in Denali and Rocky Mountain National Parks, but also from my recent visits to Istanbul, for Islamic art and pattern, and Sarajevo, the blending of cultures, the evidence of the war, and the resilience of the people. Italy is a never-ending inspiration, as I lived there for a year and the art, architecture, and landscape had a very definitive and lasting effect on my work, primarily in the conceptual. I saw an organic connection between all three, but also the art history, Renaissance painting, glazing, working in triptychs and polyptychs, and the embrace of the ideal. When I am home I am painting constantly, but I don't record the day-to-day work as frequently as I do my travels. 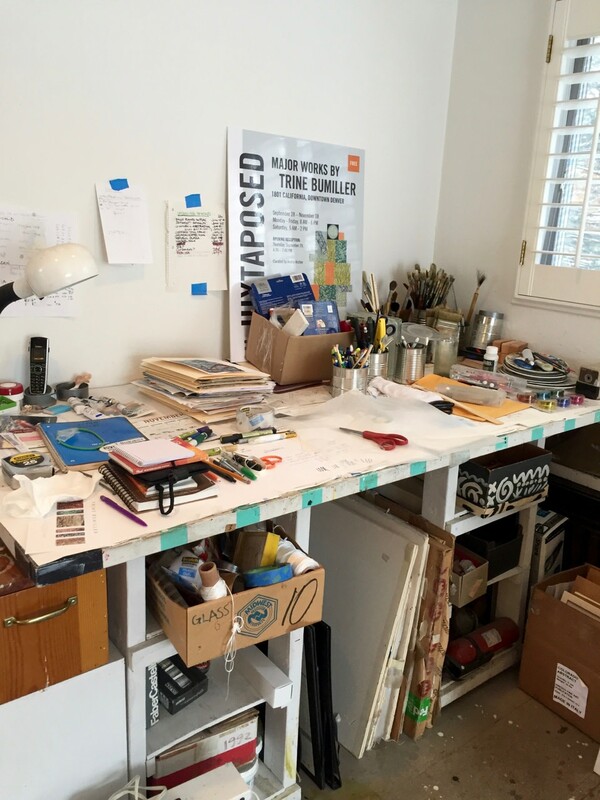 I am very organized and systematic in my work, so I can pick up where I left off. I bring notes and images with me on my trips so I can keep solving problems even if the work is far away; I am continuously sketching, writing and recording. What do your pieces in the show represent about where you are currently with your work? The work in the show is a return to more abstract images, while acknowledging my source material. After the 100 Paintings for 100 Years series, I wanted to be a little less specific about time and place. 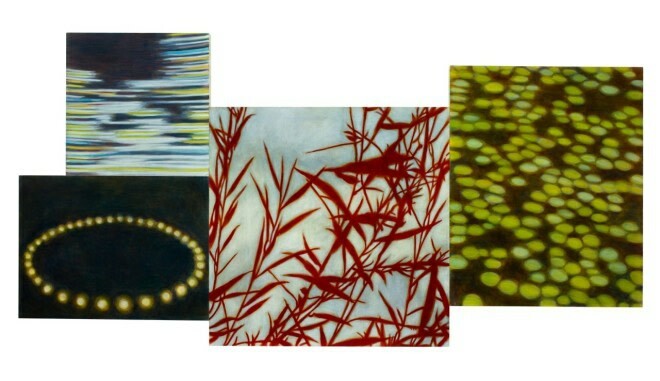 These new paintings combine natural forms with structural ones, a kind of interference. We live in unsettled times, with many ideas and images coming to us from all directions, but there is beauty in the connections, and the play between the real and the imagined or the experienced and the remembered. I want to include it all, as it is those things that vary from the usual that become the most interesting and profound. I never know until I start, but I see more paintings like these in the future. 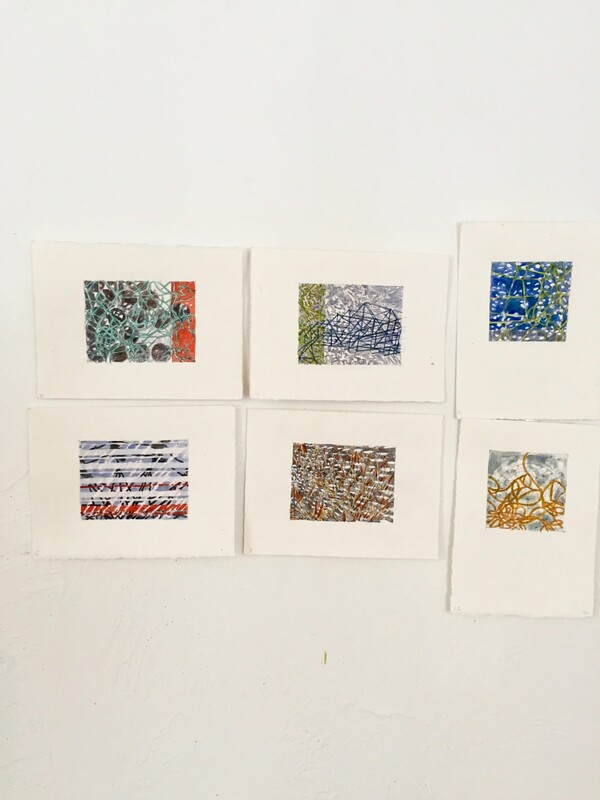 I want to see how I can explore the concept of interference and connection, past and present, and landscape and memory even further, to find some sort of universal theory of meaning through my work. Explore more of Trine Bumiller's work here.